Does ‘Year of the…’ really make a difference? Linking China with a particular wine, especially if it matches a sign from the Chinese zodiac, is increasingly common but Liv-ex questions its long-term impact. In its latest Cellar Watch report, Liv-ex examined the performance of Cheval Blanc and Mouton Rothschild, the former supposedly having profited from last year’s “Year of the Horse” and the latter set to profit from the “Year of the Ram or Sheep” in 2015. As Liv-ex explained: “It is fashionable to make connection between China and the success of a particular wine,” to whit, last year saw an ex-cellar sale of Cheval Blanc in Hong Kong, while Sotheby’s began this year with an ex-cellar sale of Mouton Rothschild also in Hong Kong. The latter was explicitly aimed at capitalising on the association with the coming lunar year of the ram. However, although the coming of the Chinese New Year can be profitable for wines with the appropriate symbolism, the direct effects are short-lived and the wider market has a much stronger pull on success or failure of a label. Liv-ex began by looking at Cheval Blanc. Like Yquem, the LVMH-owned estate’s high prices from 2005 onwards has put buyers off Cheval Blanc and led to a less than stellar performance in the secondary market. This did abruptly change at the beginning of last year – lunar year of the horse – when its share of monthly trade jumped from 2.5% on average in 2013 to 11% and 8.4% respectively in February and March 2014. It saw another spike in August – two months after the ex-cellar sale in Hong Kong – but Liv-ex calls these peaks “anomalies” and “perhaps unrelated to the buying for Chinese New Year”. Certainly if Cheval Blanc hoped to capitalise on the Year of the Horse with its ex-cellar sale, its timing in June was hopelessly out of step as buying for the festival takes place in January. Although the 10 recent physical vintages went up 1.7% between December 2013 and February 2014, this was also in step with a wider lift in the fine wine market and indeed from March onwards Cheval Blanc then fell in line with its parent Right Bank 50 index – declining 4.5%, unbuoyed by any association with equine allegory. Mouton is surging ahead of the first growth pack currently. It was the most traded of the five first in January and accounted for 14.7% of all Bordeaux trade and its most recent 10 vintages have gone up 4.6% in price. Although Robert Parker’s re-evaluation of vintages, improved trading conditions and even improved attitudes to Bordeaux have contributed to this, Mouton’s success precedes all of this as the estate has been the best-performing first growth since mid-2011 when the market began its fall. Since July 2014 it has climbed 8.7%. 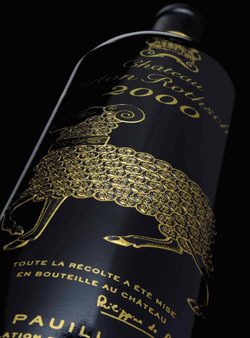 Mouton’s 2000 vintage, with its black and gold “Augsburg Ram” label, is a top performer of late (it traded for £11,500 a case last week) and is often said to be a favourite among Asian buyers. Yet, as Liv-ex continued, the fine wine market is far bigger than just Asia’s demand and there are “other factors at play”. Mouton and Haut-Brion are the two cheapest first growths at present. Mouton’s 10 most recent physical vintages are 44% cheaper than Lafite’s on average (£3,558 to £5,122 a case). The scores are lower than Lafite’s but rising quality is closing that gap fast. Mouton’s 2009 and 2010 vintages were given 99 and 97+ points by Parker compared to 99+ and 98 for Lafite in the same two years. Of course, the success of the ex-cellar sale – which made over HK$32 million – does show Mouton is popular in Asia and its timing so close to the new year celebrations may very well have helped drive the sale.